The things that make life important are family, friends and good neighbors. Being able to enjoy the simple pleasures of life with these people is especially rewarding, and purchasing St. Simons Island real estate offers many opportunities to do that. DeLoach Sotheby’s International Realty currently lists all real estate for sale on St. Simons Island that can bring you closer to the amenities this area has to offer. 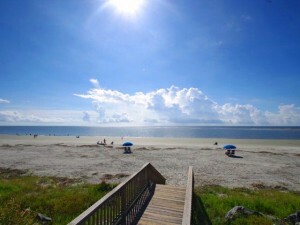 St. Simons Island Real Estate: Â A small slice of paradise that has many great things to do and see. Listed below are a few of the island’s features. The composer Ernst Levy once said, â€œMan will begin to recover the moment he takes art as seriously as physics, chemistry or money.â€ In St. Simons, we are home to several art galleries, offering residents and visitors the opportunity to â€œrecoverâ€. Our galleries include original paintings, sculptures, prints and many other unique items from local and regional artists. If art is not for you, there are many businesses that cater to the more active lifestyle. Enjoy a round of golf at The King and Prince Beach & Golf Resort or the sea Palms Golf & Tennis Resort. You could take a charter fishing cruise or rent a kayak and tour the beauty surrounding the island. After a day of art, kayaking, fishing or golf, there are many restaurants to enjoy. You can find fresh seafood, steaks and many other cuisines, cooked fresh just for you. After dinner, enjoy a wonderfulÂ dessertÂ and a leisurely stroll along the beach. St. Simons Island real estate owners and visitors alike, enjoy this wonderful place to live. Please contact us for information on properties that are currently listed in this community.